See J3374 : St Anne's Cathedral, Belfast. Part of the detail above the entrance. It represents “Christ in Glory” and depicts a number of saints. 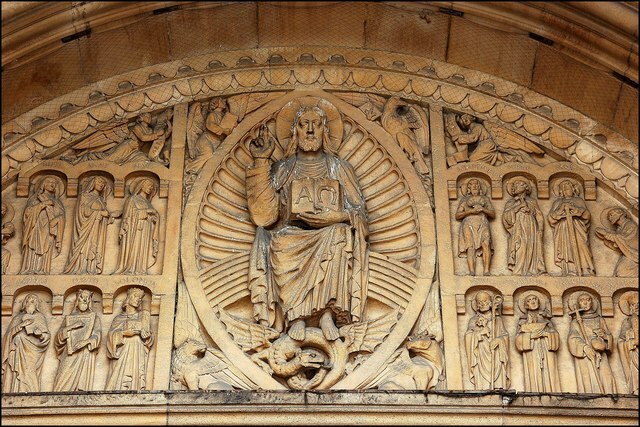 Carved by Esmond Burton whose work can also be found in St Paul’s and Ripon Cathedrals. Continue to J3374 : St Anne's Cathedral, Belfast (detail) (2). St Anne’s (Church of Ireland) Cathedral, in Donegall Street, represents the work of eight architects over the period 1898 – 1981. A building of modest size, it was, nevertheless, the last page in the architectural catalogue illustrating the growth of Belfast from a small town to a major Victorian industrial city.